Jockey Jevian Toledo accepts congratulations from trainer John Salzman, Jr. after Toledo got his first win back following injury aboard The Great Ronaldo. Photo by Jim McCue, Maryland Jockey Club. 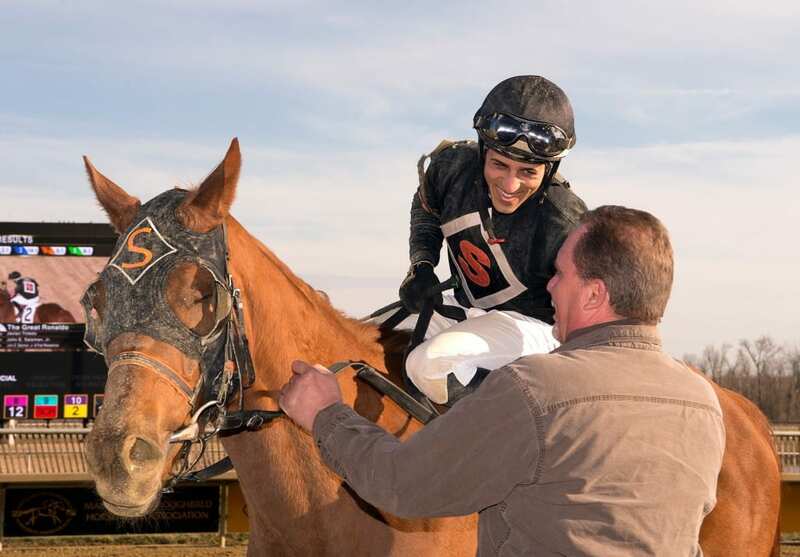 Jockey Jevian Toledo was injured January 21 in a training accident at Laurel Park, making his return this past Friday, March 9. Toledo had two mounts on Friday, finishing fifth aboard She’s Achance Too for trainer Jason Egan and sixth on Zestful for Graham Motion. He had a pickup mount in the eighth on Sunday, finishing fourth on the Jonathan Maldonado-trained Dorothyfromdublin. In the finale, in a $5,000 claiming event, he was on The Great Ronaldo for John Salzman, Jr. The Great Ronaldo broke a step slow and found himself to the rear of the field before rallying along the outside to win by 1 1/4 lengths. My horse broke slow in the first jump, and then the horse on the outside coming in, the other one coming out a little, so I had to take a little hold over there. But then I put him in the outside, he got clear and he just took off. It feels great. I gotta thanks god for getting me back and healthy, and my agent for a great job and for the trainers and the owners. I’m so happy to be back doing what I love. Can’t wait to keep rolling and doing good. (When I was injured) You know, I just feel like – I just want to get back on horses and do what I like. I like to be on horses my entire life. It feels special – so excited and nice. I’m really happy to be back and have a winner today. Notes: Jockeys Steve Hamilton and Edwin Gonzalez, shaken up in a three-horse spill Saturday, each returned with winners Sunday. Hamilton took the third race on Colonel Crawford ($9.80) and Gonzalez followed in the fourth aboard Grande Beso ($6). Jockey Elvis Trujillo, who was also involved, took off his mounts with body soreness but is expected to return Friday.